On May 15, 1945 — seventy years ago yesterday — the first Civilian Public Service (CPS) camp was opened at Patapsco Valley State Park in Maryland. 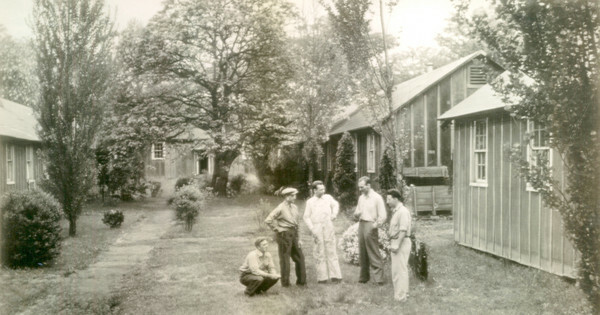 During the Second World War, conscientious objectors — mainly from Mennonite, Quaker (Society of Friends), Church of the Brethren, and Brethren in Christ churches — gave years of alternative service at camps like Patapsco. Though conditions were often spartan and separation from family and friends was often spiritually and emotionally difficult, many CPS workers would later point to the experience as an important step in solidifying their commitment to Christian nonresistance (pacifism). Here at the search for piety and obedience, we’ve blogged about CPS before. Today’s post commemorates the opening of the first CPS camp at Patapsco. I’m not sure if any Brethren in Christ served at this particular camp, but the site represents an important milestone in the Historic Peace Churches’ public profession of Christian pacifism, and thus has an important role in Brethren in Christ history. The group that opened this country’s first government-approved civilian service camp for conscientious objectors on May 15, 1941, numbered 26 men from the East Coast. They settled into long, wooden, dark-green and gray barracks with their work clothes, overcoats, linens, shaving supplies, toothpaste, books — and their religious convictions that told them war was wrong. Soon after they arrived, one man received a letter calling the men “Hitler’s little helpers” — a foretaste of greater public hostility to come after the U.S. entered World War II. Months before the attack on Pearl Harbor, however, a national pacifist experiment had begun. “That was progressive, that was cutting-edge,” said Bill Galvin, the counseling coordinator for the Center on Conscience & War in Washington. Galvin is among the organizers of a gathering scheduled near the park at Relay Town Hall on Sunday afternoon to commemorate the 70th anniversary of the opening of the first Civilian Public Service camp at what was then called Patapsco State Forest. For the first time, the federal government, in conjunction with three religious organizations, established a system allowing conscientious objectors to perform alternative nonmilitary service: working in hospitals, maintaining state forests, fighting forest fires, serving as subjects in scientific research, or building roads, dams and park benches. The program grew to include nearly 12,000 men at 152 camps in 34 states and in Puerto Rico, the Virgin Islands and Chungking, China. “It’s helpful to reflect on that history today, as we are now in a period of nearly continuous war,” said Titus Peachey of Akron, Pa., a member of the Mennonite Central Committee who helped to organize the commemoration. You can read the whole article, and check out pictures of the Patapsco camp, here. In honor of this important milestone in Brethren in Christ history, the search for piety and obedience will be collecting and sharing more stories about World War II nonresistance and CPS service. Stay tuned!